It started this way. ADOBO. Yum. Half of me clamored for some classic adobo and the other half howled for some dish that used rich gata (coconut milk). And, both sides won. Yehey. 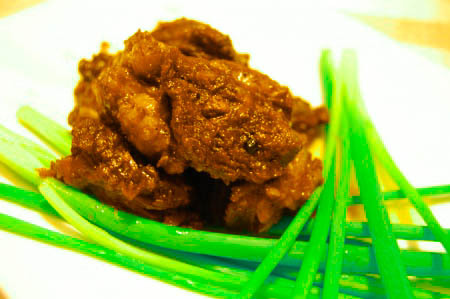 Beef, isn’t really the most popular main meat of the traditional adobo. It’s usually pork and chicken grabbing the lead star spot in any adobo fare, but hey, beef rocks too. In fact, tonight, I did both adobong baka and inadobong baka sa gata. I know that was insane. I just had to scratch the itch to cook and taste adobo in two ways. And, was it good! I am a serious advocate of pinoy food. Very serious, actually. In fact, this post has to be the nth time I am talking about adobo, otherwise touted as Philippines’ flagship dish. Yeah, mabuhay ang adobo! 1. Season beef with salt and pepper. Put garlic. Pour vinegar, soy sauce and water enough to cover the meat. Simmer. Continue adding water until meat is very tender and most liquid has evaporated. Once sauce has been reduced to half, add oil. Proceed by adding laurel during the last 3 minutes of your cooking. 2. Add gata. Stir for about 5 minutes more. Serve hot.